Last Saturday, Mom and I went over to my upline Stella's house to make Valentine's Day cards for seniors as a part of Stella's Stampers For Others. Stella had planned on several customers and demonstrators being there but it turned out to just be the three of us. We had such a great time! Here is one of four designs that I made while there. I think we made a total of about 70 cards. There will be much love shared in a Seniors' Community in town this week! Join me for a Stamp-A-Stack camp in my home from 1:00 pm to 3:00 pm on Sunday, February 21st! We will be making eight different designs - some with bright spring colors to chase away the winter blues! One of the designs will feature the new shimmer paint which was so popular during the holiday mini catalog promotion that Stampin' Up! has continued to make it available for purchase. 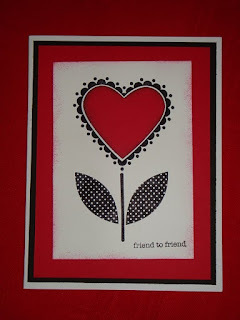 We will also be using the Big Shot, heat embossing, a Stampin' Around wheel and loads of punches! No previous stamping experience required - Mom and I will both be here to assist you. Light refreshments will also be provided. Cost for this event is $12 per person. That's only $1.50 per card. Space is limited to 8 so RSVP ASAP!